Port has its origins in the Douro region in Portugal. South African Ports have a history dating back to the early nineteenth century when production was started on the country's own Port-style wines. Because of the English love for Port, sales showed a dramatic increase during the first half of the twentieth century. Sales declined during the late 1960s and 70s, and although attempts were made to improve the standards of local Ports by planting cultivars such as Tinta Barocca, Souzao and Cinsaut, unfortunately these were still made in a very sweet style. During the late 1980s and early 90s more producers began to concentrate on the production of quality Port. Today Port is gaining popularity and a wide spectrum of Ports is made in South Africa, which lately are becoming less sweet - although Ports are never quite dry. This swing to the drier style indicates the commitment of the South African Port Producers' Association to the improvement of local Ports. Good Ports are much sought after and at recent wine auctions, including the Nederburg Auction, Port fetched more than double that of other fortified wines. The best Ports are made from blends and include cultivars such as Touriga Nacional, Touriga Francesa, Tinta Barocca, Tinta Roriz, Cornifesto and Souzao. Port grapes are harvested at full maturity and are crushed by mechanical means. Fermentation takes place in either traditional open casks or in modern, closed, stainless steel fermenters. As with red wines, the skins tend to rise during fermentation and the 'cap' so formed has to be punched down or the wine pumped over to get colour and flavour extraction. Once the correct sugar level has been achieved through fermentation the wine is then fortified with the finest brandy spirit. The Port is then aged in wood, the period of maturation depending on the type of Port being produced. Some like the Vintage Ports mature in large vats while Tawny Ports on the other hand, are matured in small 500-litre "pipes" before they are bottled. • Cape Port with Year of vintage - A Port of one harvest, dark and full-bodied, aged in wood of any size. The words "Vintage Port" and date of vintage may appear on the label. • Cape Vintage Reserve Port - A Port of one harvest, produced in a year of recognised quality, with exceptional organoleptic characteristics, dark and full-bodied, with very fine aroma and palate. The producer can be assisted by a tasting panel set up by the Association. The wine must preferably be aged for an average of at least one year or more in wood of any size. The wine must be sold exclusively in glass. The words "Vintage Reserve Port" and date of vintage must appear on the label. • Cape Late Bottled Vintage or LEV Port - Should be a Port of a single year of quality, be dark and full-bodied with signs of going tawny in colour. The main label could indicate the year of bottling as well as the vintage, and the description "Late Bottled Vintage" or "LEV" must appear on the label. 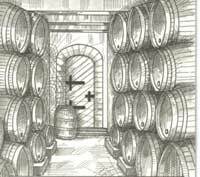 The Port will be aged for three to six years, of which at least two years in oak, before bottling. • Cape Ruby Port - A blend of young, full-bodied, round and fruity Port. Components could be aged in wood for up to three years depending on the size of wood used, but no components should be aged for less than six months. The average age should not be less than one year. • Cape Tawny Port - A blend of wine that has been wood matured. It must be amber/orange (tawny) in colour and must have acquired a smooth light, slightly nutty flavour. Blending of white and red Port for tawny Port will not be allowed. • Cape Dated Tawny Port - Wine of a single year which must have the character of a Tawny Port and the label must include the year of vintage, the words "matured in wood" and the words "Tawny Port". • Cape White Port - Made from a non-muscat white cultivar, aged in wood of any size for a minimum period of 6 months. The Knysna-Tsitsikamma region has the country's biggest indigenous forests; a fairyland of ancient forest giants, ferns and colourful birdlife.